We utilize the New Vectus Laser by Palomar. This new technology uses light energy which stops the hair from growing without harming any of the surrounding cells. The laser power is focused to selectively inhibit the hair from growing in a certain area. Laser Hair Removal works best on fair skinned, dark haired individuals. Much less laser energy is taken in by the skin and even more by the hair roots because the main target in hair roots is melanin pigment. The pigment in the hair is the target for the laser energy, gray/white hair (which has no pigment) can not be effectively treated with any sort of laser or light-based equipment. Multiple sessions are necessary for optimal results. Laser power has the best result on hair roots; as the inactive hairs become active, usually within 3 weeks to 3 months, some new hair development will be seen. A minimum of 3-6 treatments over the course of a year will usually be required for the best possible outcomes. Slight reddening of the area treated as well as some nearby areas, swelling, feeling like you have a sunburn has been noted in some customers. These results usually last about 24 hours or less. Dr. Dadurian or our nurse practitioner, Nicole Norris will be happy to review with you the possible adverse effects from Laser Hair Reduction. BioAge MD offers the newest technology on the marketplace for Permanent Laser Hair Reduction. This innovation is superior to any other on the marketplace. The Vectus laser permits companies to quickly treat unwanted hair, even on the biggest areas such as a back, in less than five minutes. Due to the huge treatment applicator, the Vectus at BioAge MD in West Palm Beach is able to lessen the need for multiple, overlapping passes. Additionally, it showcases the Skintel Melanin Reader, which is the only FDA- Cleared melanin visitor, aiding a safer and maximized hair removal treatment. Because it minimizes human mistake in therapy setups, the melanin reader is vital. In addition to all the benefits this laser system offers, it has a built-in cooling system to keep the outer layer of skin cool and comfortable throughout the therapy. 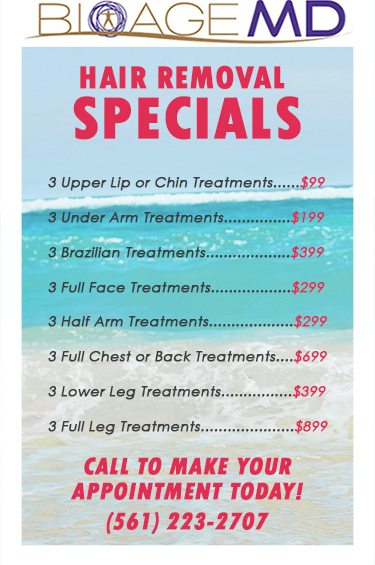 Our medical health spa provides a comfortable setting for an enjoyable Laser Hair Reduction Treatment.